Fermented foods are all the rage. Fermented foods add the much needed good bacteria to our gut. We can take probiotics which are expensive or eat fermented foods such as sauerkraut which is just fermented cabbage. Choosing the best foods can keep your gut healthy. Prebiotic foods are also important because they feed the good bacteria. Even garlic and mangos can feed the good bacteria. I have written about this before in another blog from four years ago. I am now into making Fermented Pickles using another new and even easier product. There is a brand called Pickle Pipes. I bought a similar brand but they are a silicone air lock disk with a slit on top to let gases escape but it won't let air get in. There are youtube videos showing the Pickle Pipe brand. I think they are all basically the same. I started out with an English cucumber. This time of year I couldn't find any small dill sized cucumbers in our local store. English cucumbers have small seeds and they aren't dipped in wax. They are generally shrink wrapped and look a lot like a zucchini. Other cucumbers are sometimes dipped in wax and will get moldy more easily unless the wax is completely removed. I cut the cucumber in strips. The strips have to be shorter than the jar so they can be completely covered with liquid. While fermenting, the vegetable must be under liquid at all times so it isn't exposed to air. The air lock disk fits over a wide mouth jar. The jar must be washed in the dishwasher or hot soapy water and then rinsed. The silicone disk and rim must be clean. After cutting up the cucumbers, place several pieces of dill weed in the bottom of the jar. Place a clove of garlic in the jar. Don't crush the clove. Place the cucumbers and several bay leaves in the jar. The bay leaves keep the pickles crisp. Mix about 4 cups of warm non-chlorinated water with 1 1/2 Tablespoons of sea salt. Stir completely and when your jar is prepared, fill the jar with the salt water. Make sure the water completely covers the cucumbers. If necessary put a glass weight over the cucumbers to keep them from floating. If you pack the jar tightly the weight will not be necessary. Put the disk on and screw on the rim. Put the jar in a dark warm place for four days. After four days, they are ready to eat. Keep them in the refrigerator. They will last a long time, but they usually get eaten quickly so I'm not sure how long they will keep. I made a new batch. 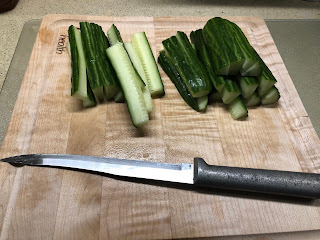 This time I cut the cucumbers in chunks. I have never done them this way before so it will be interesting to see how they turn out. I think they will taste the same. I don't know how many probiotics are in these pickles, but they taste good and every little bit will help your gut. Thank you for the recipe, Barb. I will give it a try. I have been trying to get my pickles to taste like a fresh deli pickle, with no success. I think I am using too many herbs. Why don't you crush the garlic? Where did you find fresh dill this time of the year? Have you ever used dried dill seed or dried dill weed? Thank you for inspiring me to give it another try. I have never seen these silicone disks. Do you see your pickles with bubbles on the top?